I shouldn’t have been so pessimistic about the Yamaha dealer here in Arequipa. I got the most personalised service of any garage I have visited in South America to date, and I doubt it will be bettered in the future. When I returned to the garage on Tuesday afternoon, I found the owner, Fernando, beside my bike. The tank was off, the coolant system stripped down and the parts laid out neatly on a very orderly work trolley – a far cry from the cheerful chaos of the workshop in Calama where parts and tools were strewn across the workshop floor. Fernando is a qualified mechanical engineer, a motorbike rider and clearly a talented and precise mechanic. I found him testing the resistance of the fan’s motor whilst at the same time explaining carefully to his assembled mechanics what he was doing. As he slowly rotated the fan, the resistance reading remained constant until a certain point where is dropped markedly. Herein lay the problem, and the explanation why the fan operated on some occasions and not on others. The next – and most important – question was whether Yamaha in Lima had a new fan. They didn’t, and to get one would cost in excess of $300 and a 3-4 week wait. So Fernando worked a little more magic. He somehow cleaned the internal workings of the fan, despite it being a sealed unit, and managed to remove the ‘resistance dead spot’. So theoretically the fan should operate properly. I may not need it for some time, as we will now be travelling across the Altiplano and through the mountains at elevations between 2500-3800m, and so only time will tell. Thus far, we had received a normal, albeit diligent service, with my valves adjusted and some work also done to the Suzuki. But then we were treated to the ‘special package’. Earlier in the week, Pau and I somehow found ourselves in conversation with Fernando about local Peruvian food. “I shall take you to a local restaurant to sample the regional specialities”, he proclaimed. Yesterday he kept to his word. After visiting the garage to settle our bills, the three of us drove to what is clearly a local haunt of high repute. We found a table and let Fernando take charge. Ordering a series of small platas – all very traditional to the region – we worked our way through deep-fried cheese served with a hot relish, a simple potato, pepper and tomato dish dressed with a eye-wateringly potent vinegar, series of simple stews and meat dishes, and finishing with an frozen sweet butter pudding. To Fernando, this was the side show. Unable to hide his enthusiasm and with a slightly mischievous look in his eye, he introduced us to the local alcoholic speciality which he mixed for us at the table: chicha, local beer and a clear anise liqueur. 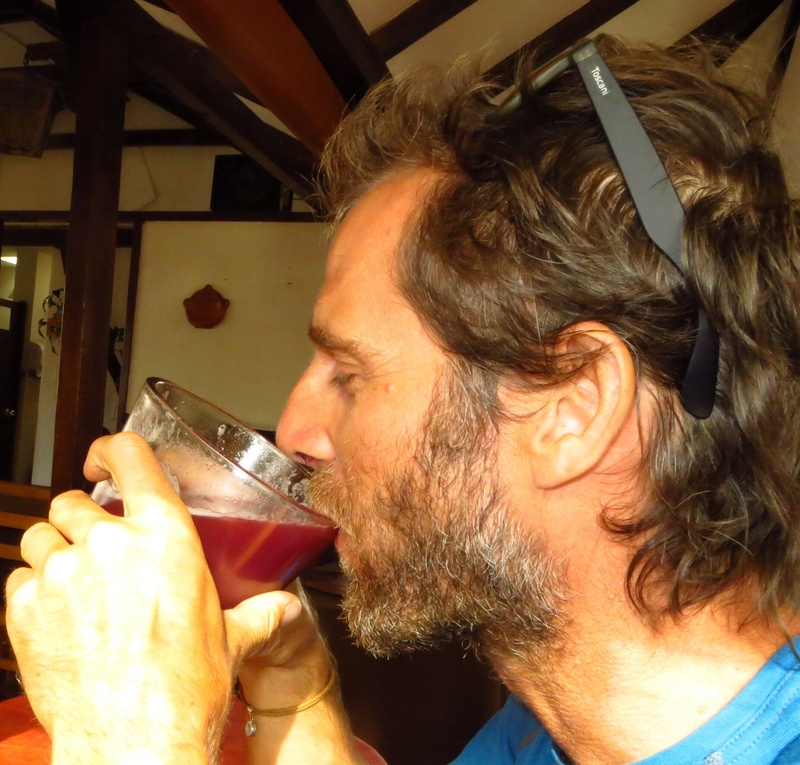 A sweet, fruit-based alcoholic drink, Chicha is found also in Chile where is it made from fermented grapes. Here in Peru it is made from a variety of fruits: apple, strawberry, raspberry, orange and others. It is not obviously alcoholic by taste, but it’s effect when mixed with beer and anis certainly is. We worked through two servings, the latter being drunk from a single, large glass past between the three of us as is the tradition. When the time came to leave, Pau and I were clearly not driving home. Fernando, however, was driving to the beach that afternoon. He refused to let us pay and waved us on our way, as we slowly wandered back to the hostel through the busy streets. There was only one place I was going when I got back – to bed. It is such encounters that add so much to a trip like this, and which for me define the essence of this continent. Time and time again I have found myself at the receiving end of a stranger’s hospitality or assistance. In Patagonia, for example, when I broke my transmission, the local mechanic worked all day to fix my bike whilst also inviting me to his parent’s home for lunch and his own home for dinner. It seems to come easily to the Latin Americans. Such generosity and assistance smooths the road when it gets rocky, but more importantly it reminds us of those basic human qualities that can be hard to find back at home. So tomorrow we move onwards, to Lake Titicaca. Arequipa is a city that seduces you and can easily trap you. Despite my mild protestations earlier, we have both been more than happy to be ‘stuck’ here for a few days. But the Sacred Valley, and friends there are calling. Hi Paul. This is Alejandro “the Colombian on a Harley” from the Dakar. Happy to see that you guys are doing well and heading north. I finally got home ok. No problem at all. Hola Alejandro!! We’re coming your way, so see you in the next couple of months I hope! !